India has crossed the 1 Billion smartphone user mark in 2015. India becomes the second country with 1 Billion smartphone users. In October 2015, India crosses the 1 Billion smartphone users mark and becomes the second largest smartphone user country after China. In the month of October in 2015, the number of smartphone users rises 0.7% by the September month and reached 1.03 Billion mark. If you were thinking that the United States has most smartphone users then you are wrong. The United States is far away from the figure of 1 Billion. 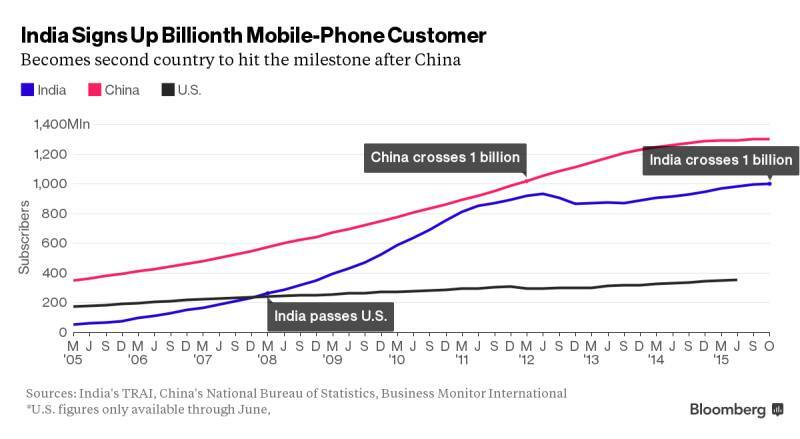 The first country to have 1 Billion smartphone users is China. Then at second place is India. India has taken over the United States in 2008 in terms of smartphone users. After then the numbers keep increasing and now India becomes the second country with 1 Billion smartphone users. After 2008, India has added 800 Million smartphone users. It is just the double of the population of the United States. This is the big reason that every smartphone maker wants to do business in India. To increase the numbers of smartphone users in the country, few smartphone companies are responsible. Companies like Micromax, Lenovo, Huawei, etc. Produced low-cost smartphones in the country. This increases the number of users in India.